Selina, Downtown Columbus Ohio. January 29, 2010. When Selina and I scheduled this shoot, we knew it would be chilly in late January, but we had no idea when they day arrived that it would be bone chillingly cold. But we decided to go ahead anyway. So she made the trip from Kentucky to Columbus Ohio for our photo shoot. We worked in several locations around downtown Columbus. The wind chill was 4°F so we took all of the normal precautions for a cold weather shoot. This photo was taken in a back alley. The main light for the shoot was an off-camera flash to camera right. The car sitting in the alley with its headlights on was a lucky plus. It created the nice splash of light along the wall to the left which helps make the image. Off-camera flash is really valuable in a lot of situations and it doesn’t have to take much equipment (or cost) to get your flash off the camera. This photo ended up being published internationally. It is my favorite image for January 29 and one of my all time favorites portraits. If you have been following this series since the beginning, you might have noticed her before from a shoot on a much more pleasant day in August. I was driving country roads in southern Iowa looking for wildlife. I had two cameras ready to go, one with a 24-105mm lens and the other with a 100-400mm lens. There are two reasons for that. With only one camera, there is always the chance you will miss something exciting if you don’t have the right lens on the camera. On a cold day it is also a pain to change lenses outside with the wind blowing like crazy. I would get out of the car to photograph wildlife tracks and interesting patterns in the drifting snow, then get back in the care to get out of the wind and the -12°F windchill. I did not have the heat on. Taking a camera from cold outside air into a warm car can cause cause hundreds of dollars in damage to the camera. I found a nice bunch of Cedar Waxwings and I was photographing them when I spotted a bunch of birds scurrying along behind them in the undergrowth. 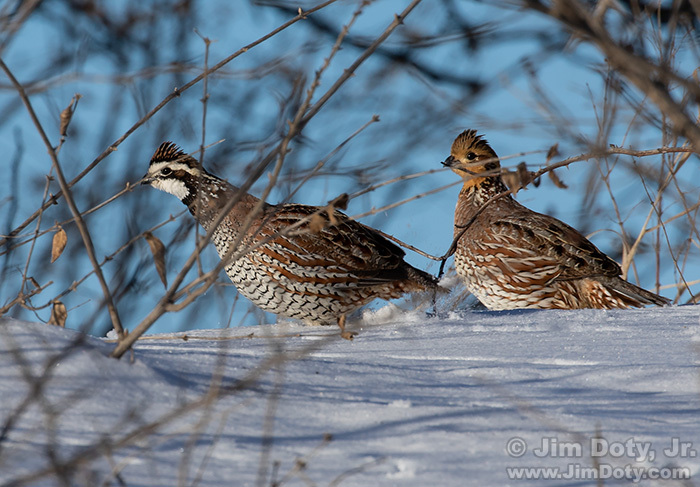 It was a covey of Northern Bobwhites. I took several photos as they ran by. This is my best image of a male and female that are both in reasonably good focus. This is my second favorite image for this date.